Attendants in 2015. For more details about Air India recruitment 2015 for attendants read out further. Age Limit : Candidates must be aged between 18 Years to 24 Years as on 1st January 2015. Education Qualification : Candidates must be passed Graduation or 10+2 with Diploma in Hotel Management / Catering Technology from any recognized Institution with 1 to 2 years of experience in manning Reception / Front Desk at Hotels / Hospitality Industry. Application fees : General / OBC candidates have to pay Rs 500 and SC / ST / Ex-Servicemen Candidates are exempted categories. 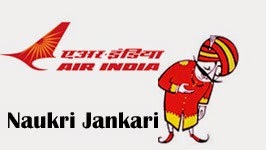 0 comments for " Air India Attendants Recruitment 2015 Notification details "